The last step in the long journey of AMPARs is their delivery into the specialized dendritic membrane that constitutes the postsynaptic terminal. AMPARs can reach synapses by two distinct pathways depending on their subunit composition. GluR2-GluR3 oligomers continuously cycle in and out of synapses in a manner largely independent from synaptic activity1,34. This process (constitutive pathway) preserves the total number of receptors at synapses, and therefore, it has been proposed to serve to maintain synaptic strength in the face of protein turnover35. This constitutive cycling is very fast (half-time of minutes) and it requires a direct interaction between GluR2 and NSF36, which seems to be important for the recycling of AMPARs back into synapses37. The continuous synaptic cycling of AMPARs also requires the molecular chaperon Hsp9038, although the mechanistic link between AMPARs and Hsp90 has not been elucidated yet. There are multiple evidence that the constitutive cycling of AMPARs involves endocytic and exocytic trafficking; however, its connection with the known intracellular machinery that controls recycling endosomes is far from clear. For instance, AMPAR synaptic cycling requires the small GTPase Rab839, which is involved in trans-Golgi network (TGN) trafficking and some forms of endosomal recycling40. However, other Rab proteins typically associated with recycling endosomes, such as Rab4 and Rab11, are not involved39. As for the endocytic part of this cycle, the best characterized endocytic Rab protein, Rab540, does not participate in this constitutive cycling either41. Obviously, more work will be required to elucidate the cellular basis of this very dynamic aspect of the intracellular trafficking of AMPARs. In contrast with their constitutive cycling, AMPARs containing GluR142, GluR2-long (a splice variant of GluR2) , or GluR410 subunits are added into synapses in an activity-dependent manner during synaptic plasticity. This regulated pathway acts transiently upon plasticity induction, leading to a net increase in the number of AMPARs present at synapses. This addition of new receptors results in the long-lasting enhancement of synaptic strength also known as LTP. LTP is one of the best characterized paradigms of synaptic plasticity4. It is now well established that the opening of NMDARs with the concomitant rise in intracellular Ca2+ at the postsynaptic terminal triggers the regulated insertion of new AMPARs into synapses. Multiple signaling cascades are thought to be activated downstream from Ca2+ entry, and it is likely that complicated interactions between different signaling pathways control the regulated addition of receptors. There is abundant molecular and electrophysiological evidence supporting critical roles for the Ca2+-calmodulin-dependent protein kinase II (CaMKII), PKA, PKC, and the mitogen-activated protein kinase (MAPK) in synaptic plasticity, and in particular, in LTP (see ref. 44 for a recent review). In a model recently proposed45, LTP is mediated by the activation of CaMKII, which in turns activates Ras by inhibiting a synapse-localized Ras GTPase-activating protein (SynGap). The downstream effectors of Ras that mediate AMPAR synaptic delivery are still unclear, but they may involve well-known Ras effectors, such as p42-44 MAPK, and/or phosphatidylinositol 3-kinase (PI3K)46. 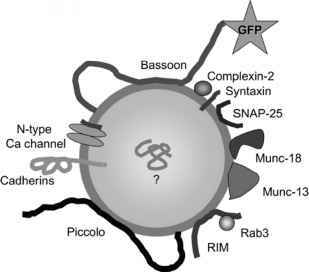 Still, the precise mechanisms that trigger AMPAR synaptic delivery remain unknown. The AMPAR subunits are known to be direct targets for some of these signaling cascades. For instance, PKA phosphorylates GluR1 at Ser845, and this event is required but not sufficient for AMPAR synaptic delivery and/or stabilization47,48. In addition, a new PKC phosphorylation site was very recently identified in GluR1 (Ser818), and this phosphorylation event seems to be directly involved in AMPAR synaptic delivery during LTP49. Interestingly, the signaling cascades controlling the delivery of AMPARs to synapses, as well as the AMPAR subunits involved, change during development. Thus, early in postnatal development of the hippocampus, the regulated delivery of AMPARs involves GluR4-containing receptors10, and PKA-mediated phosphorylation of this subunit is necessary and sufficient for triggering delivery47. Around the second postnatal week, LTP is mostly mediated by the synaptic delivery of GluR2-long43. Then, later in development, the regulated addition of AMPARs involves GluR1, and its phosphorylation by PKA is required, but no longer sufficient for delivery47. Therefore, the number of signaling pathways that need to be activated for AMPAR synaptic delivery increases during development, in agreement with the empirical observation that synaptic plasticity is more difficult to trigger later in life. Transmembrane AMPAR regulatory proteins, or TARPs, are the only known transmembrane proteins found to be associated with AMPARs. The first TARP to be identified was stargazin, which was found as a spontaneous mutation in the stargazer mouse50 and is critically required for cell surface expression of AMPARs in cerebellar granule cells19. By sequence and structural homology, stargazin belongs to a large group of proteins that includes y-subunits of Ca2+ channels and the claudin family of cell-adhesion molecules. Nevertheless, only four of these proteins bind AMPARs and affect their trafficking: stargazin, y-3, y-4, and y-8. Therefore, these are the four proteins that are designated as TARPs. Interestingly, different TARPS display specific patterns of expression in brain, which are to some extent, complementary18. TARPs associate with AMPARs early in their biosynthetic pathway and are able to combine with all AMPAR populations, irrespective of their subunit composition18. The most striking property of TARPs is their critical role for the expression of AMPARs at the extrasynaptic neuronal surface. Genetic ablation of stargazin, the TARP member most abundantly expressed in cerebellum, results in a virtual depletion of AMPARs from the extrasynaptic surface in granule cells19. A similar result is obtained in pyramidal neurons of the hippocampus after removal of y-8, a TARP member that is almost exclusively expressed in hippocampus51. Interestingly, TARPs seem to be a limiting factor for AMPAR cell surface delivery, since overexpression of the appropriate TARP in different brain regions leads to a marked increase in the number of AMPARs expressed in the neuronal surface19,51. The role of these extrasynaptic surface receptors is still being debated, although morphological and electrophysiological evidence indicates that they are much more abundant than AMPARs present at the synaptic membrane. It has been observed that extrasynaptic surface receptors are highly mobile, and it has been demonstrated that they can reach the postsynaptic membrane through lateral diffusion from the extrasynaptic membrane52. 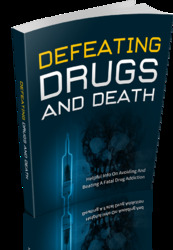 This topic is specifically discussed in Chapter 15 of this book. trafficking (cell surface expression and synaptic delivery through PSD95 interaction) are well established. However, it remains to be demonstrated whether they constitute necessary sequential steps for the delivery of AMPARs into synapses. AMPARs are integral membrane proteins. Therefore, all the trafficking processes described in this chapter necessarily involve the transport of the receptor along intracellular membrane organelles or receptor sliding through the cell surface (or a combination of both). In this sense, it may come as a surprise that so little is known about the subcellular organization of the membrane trafficking machinery that mediates AMPAR synaptic delivery. One plausible explanation for this gap in our understanding is that most of the trafficking events that are relevant for synaptic function may occur in the micron, or even submicron scale, within the environment of dendritic spines. This poses a significant challenge for the molecular and morphological identification of the membrane trafficking events that mediate AMPAR synaptic delivery. In this section, I will mention a few studies that have started to address this issue by investigating the components of the intracellular membrane sorting machinery that control AMPAR transport into synapses. Most intracellular membrane sorting in eukaryotic cells is governed by small GTPases of the Rab family40. Therefore, the identification of specific Rab proteins involved in AMPAR trafficking may give us some clues as to how the intracellular sorting and synaptic targeting of AMPARs is organized in neurons. 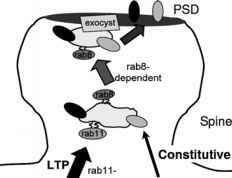 It was recently described that the small GTPase Rab8 mediates AMPAR synaptic delivery during both their constitutive cycling and regulated insertion upon LTP induction39. These results suggest that the TGN and recycling endosomes (both compartments in which Rab8 resides) are intracellular membrane sources for AMPAR synaptic delivery. However, the situation is likely to be more complicated, since Rab 11, another small GTPase involved in the trafficking of recycling endosomes, was also shown to be absolutely required for AMPAR delivery during LTP56. Therefore, it is likely that the activity-dependent delivery of AMPARs involves a relay of at least two distinct endosomal compartments, whose sorting would be controlled by Rab 11 and Rab8 in a sequential manner. Interestingly, as mentioned above, the constitutive cycling of AMPARs only requires Rab8, but not Rab 11 or Rab4 (another Rab protein associated to recycling endosomes)39. This result emphasizes that the two pathways for AMPAR synaptic trafficking involve, to some extent, separate intracellular membrane compartments (Figure 24.2). Dendrite (see further explanation in the main text ). The functional studies mentioned above have not addressed the subcellular localization of the endosomal compartments that sort and deliver AMPARs into the synaptic membrane. However, the different requirements of the constitutive and regulated trafficking of AMPARs suggest a potential spatial organization of these membrane transport events. It is now well established that the regulated delivery of GluR1-containing AMPARs involves their translocation from the dendritic shaft into the adjacent spine, in a process that can be triggered by LTP induction57. In contrast, GluR2 AMPARs constitutively enter the spine compartment, as part of their continuous cycling1. As mentioned above, the regulated delivery of GluR1 requires both Rab11 and Rab8, whereas the constitutive delivery of GluR2 receptors is only mediated by Rab8, which is not required for receptor translocation into spines39. Since GluR1 delivery involves one extra regulated step (transport into the spine) and requires one additional Rab protein (Rab11), it is tempting to speculate that the translocation of GluR1 receptors from the dendritic shaft into the spine is governed by Rab11. According to this model, once inside the spine, the receptor would reach a different endosomal compartment, whose sorting would be controlled by Rab8. In this scenario, GluR2 would not traffic through the Rab 11-controlled compartment, and therefore, would be free to enter the spine constitutively and reach the Rab8-containing compartment. Finally, the delivery of both GluR1 and GluR2 receptors into the synaptic membrane from within the spine would be controlled by Rab8 (see Figure 24.2 for a schematic representation of this scenario). Although this model has not been proved yet, it is compatible with all the electrophysiological and morphological evidence available. Another important aspect of the intracellular trafficking of AMPARs is how the receptor is finally inserted into the postsynaptic membrane. Preliminary results from our laboratory point toward the exocyst complex as a critical component for this late step in AMPAR synaptic delivery. The exocyst is a multiprotein complex originally described in yeast to be required for exocytosis58. Our recent experiments suggest that the exocyst may act as a downstream effector of Rab8 for the targeted insertion of AMPARs at the postsynaptic density59. In particular, we have found that blockade of the exocyst subunit Exo70 does not prevent AMPAR translocation into spines, but drastically impairs AMPAR fusion with the postsynaptic membrane. In fact, interference with Exo70 function leads to the accumulation of AMPARs inside the spine, forming a complex physically associated, but not yet fused with the postsynaptic density. These recent results indicate that the exocyst is one of the latest factors that mediates AMPAR insertion at synapses, probably acting as a landmark for Rab8-driven exocytic trafficking of AMPAR-containing vesicles within the spine (see Figure 24.2).